FWIW: Posting this before Wednesday’s injury reports are in – using Tuesday night’s only – which leaves last minute scratches up in the air, especially for defensive players who pay the highest price for short-week games. 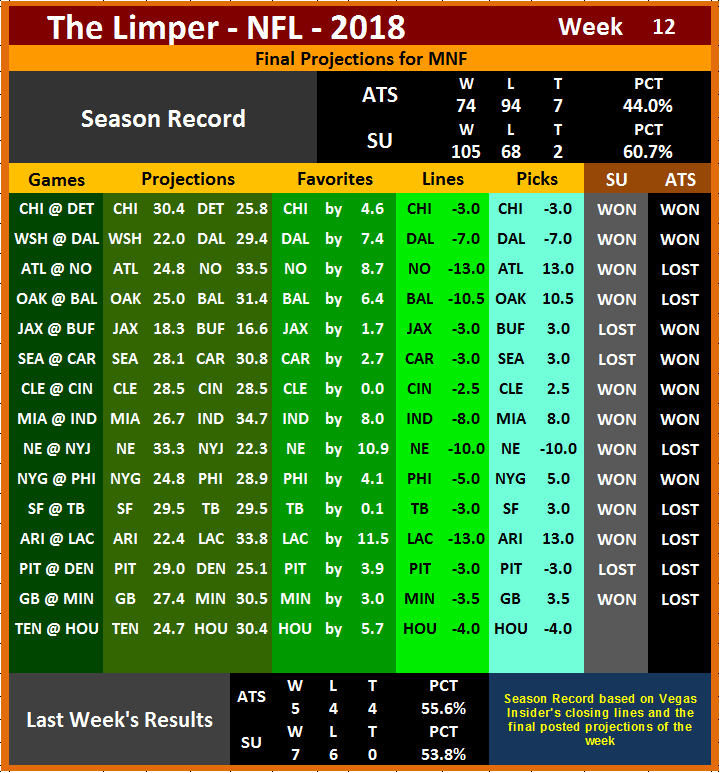 FWIW – Up in the cloud my model tracks lots of data – some relevant to the average bettor, some not – and in the spirit of the holidays, I thought I’d start sharing what’s been gleaned thus far this season. Dogs are again on the upswing, and home dogs are looking better and better. Off-hand, I can’t remember which team is responsible for that 40 point win, but they should be ashamed of themselves; and, in case you’re wondering, there’s been only 1 hundred-plus total this season – 0.6% - which of course was Monday, but otherwise, the outcome – a 3 point win – fit the averages nicely.